Elizabeth is a social and medical anthropologist, and research associate of the University of Oxford. She is currently working from her home in Fuerteventura, Spain, where she lives with her husband and two children and an ample agroecology plot. She is the Vice-President of Semillas al Viento, a community-based, holistic education association and school in Fuerteventura. She is the focal point for education and pedagogy in the Global Environments Network, facilitating Network-wide collaboration and activities on the theme. It’s a year now that our parent-led holistic education project and association, Semillas al Viento, has been up and running. 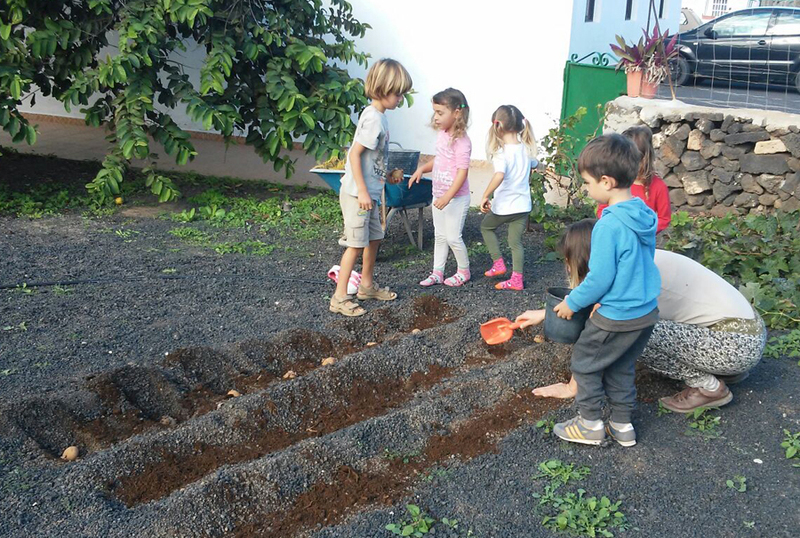 The project took off last summer when the President of the association, Brenda Andreoni Kunz, initiated a summer camp, generously letting out her house and garden for all those in favour of an holistic ‘free’ education. We’ve since defined what ‘free’ is to us and now rent a large, fully equipped house and garden in the small village of Lajares. We employ two qualified teachers: one nursery teacher specialised in pedagogy, and one primary teacher with a degree focused on special needs. We also have a ‘nest’ (el nido) for 0-3 year olds, run by forest-schooler, Ariana. Our plans are to extend our student base and include the secondary years, and attain legal school status. As part of this, we want to develop a ‘glocal’ curriculum – we’ll get to that in a minute. Don’t get me wrong, there is nothing really awful – although you might get the odd awful teacher – about the education system in Fuerteventura, the Canary Islands, Spain. Kids go to school from 8.30 a.m. to 13.30 p.m. with the option, in larger schools, to stay on an extra hour and have lunch there. After school, there is a range of activities on offer, organised by the parent’s association and other independent organisations. 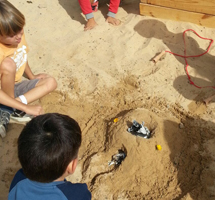 Kids can also play on the beach and in the village. In the primary years, they are taught Spanish, maths, natural and social sciences, English, music, art and design, basic sports and religious or ‘moral’ studies – what would be citizenship studies in the UK. Class sizes are limited to 22 children. Some teachers have drop-in assistants and others don’t. The state-led approach to education is book-based. This is significant because schools and their teachers are not actively engaged in elaborating teaching materials. Rather, they depend on the publishing houses to elaborate on otherwise very general national curriculum guidelines and produce worksheets, which teachers tend to rigorously –almost religiously- follow. This is true even for the specially tailored books for the autonomous communities of the Canaries, which attempt to incorporate local geography and culture into the social and natural sciences. Schools could opt not to have any books, and a handful have done so, but this requires considerable work and stability from the core teaching staff. This leads me to another special feature of education in Spain, or at least the Canaries: the permanent position of teachers as civil servants. This means that in Fuerteventura, one of the less favoured teaching designations, teachers rotate and we often end up with those tired of the education system themselves. On a broader level, this also lends considerable curricular and pedagogic variation within the system, not to mention making it hard to establish any long-term relationship with the teachers and/or director, and upsetting day-to-day and year-to-year internal rhythms that children –and their parents – get used to and need. Other issues that we face are generic, rather than Spain-specific. They are pretty well outlined in Wade Davis’ documentary ‘Schooling the World’. Although this has a specific focus on the education of indigenous groups, his insights are easily applied to even the most cosmopolitan of international cities. My children have been to school here in Spain and the eldest in the city of Oxford too – at one of the ‘best’ schools there. But neither the Canaries nor Oxford has satisfied me. I haven’t been able to get to grips with the existential ‘why’, ‘what’ and ‘how’ of education, the student-teacher hierarchy, the leverage and the atmosphere. 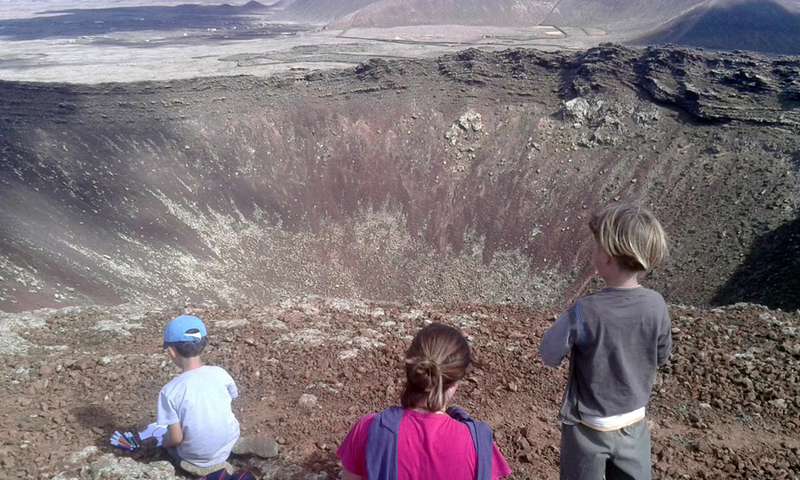 In the spring of 2015, in Fuerteventura, I held a meeting to gauge interest in educational alternatives in the house of a home-educated girl who was four at the time. We had an overwhelming turn out. I talked about establishing outdoor, field-based and experimental learning, buying land and putting up Moroccan-style ‘activity’ tents (for carpentry, PE and Canarian boxing, music, etc.) to provide a bespoke socio-environmental education and peer-to-peer and intergenerational learning. There was a huge amount of interest, which got the ball rolling. Around the same time, I attended a course on ‘natural learning’, which focused on the immersive, cooperative, peer-learning and eliciting methods of the TEKOS school in Russia, and I met some like-minded others there too. Despite this, there was very little help or collaboration to be had – just a lot of eager phone calls asking when on earth I was going to open the school! Parents were desperate for an alternative. Brenda didn’t make it to the meeting, but news of it got her boat steaming too. We both took our kids out of school. She had just inherited a sum of money and decided to invest it in starting a school. She recruited a teacher and then another. With a business to run, she was keen to immediately sign her kids up for the project. I brought mine home, and started out volunteering as an English teacher once a week and then started assuming other roles, mainly to do with the curricular and pedagogic vision. Two months later I put my kids in the project 3 days a week and complemented this with home-schooling. I then became Vice-President. It’s not been an easy run. Pedagogy has been the major source of conflict. Parents with young children knew they wanted something different than what was on offer, but didn’t know quite what it was they wanted. Amidst various fears and insecurities about what and how to educate kids in the Rebecca Wild ‘free’ doctrine, they advocated for a non-directed, child-led education with virtually no adult intervention; but found this very hard to put into practice. One of our teachers was Waldorf Steiner-trained and eventually dissented, taking with her a bunch of parents who were in favour of such a tried and tested method. Others dispersed. The biggest difficulty has been focusing on the larger objective – in a nutshell, a community-based education that respects kids’ impulses and rhythms – and this has been lost in what seems like fluctuations in parental insecurities and the ‘special needs’ of one’s own children. What we have already achieved is remarkable. It has a lot to do with the investment, constancy, clear-mindedness and entrepreneurial skills of our President, Brenda. Brenda has no experience in education; she’s a business woman with a head for start-ups and a financial mind that measures risks and assesses long-term feasibility. She is also an exceptional person. Her patience, accommodating of various perspectives and approaches, her buffering for the teachers, tact and emotional intelligence with our parents has been key to the project’s continuity. Our core teacher, the Galician (northern Spain) Teba, has an excellent rapport with parents and kids alike. She’s kept our little ones happy and well occupied and maintained herself in spite of on-going uncertainty and the unexpected dissent of her Steiner colleague. She continues with us and is now supported by young Cristina, a lively Andalucían early-years teacher, well-versed in pedagogy and the Danish education system and with considerable initiative. In a bid for a more horizontal organisation, this year we’ll be handing the reigns over to them. We have now defined ourselves as a ‘project-based’, ‘free’, ‘active’ and ‘democratic’ school. This means that there is a lot of student-led activity and freedom for the kids to explore and play. The ‘active’ part means that we also offer activities and workshops, which are based on Howard Gardner’s theory of multiple intelligences, and invite the children to join in. But they are not obliged to do so. The ‘democratic’ part basically refers to the fact that we hold an assembly in which all the children get to say and decide what they are doing that day, and in face of conflict, they vote democratically (the teachers also have a say!). The curriculum is organised around the children defining their own personal or collaborative project and the ‘teachers’ facilitating its achievement. Over the course of a project, like building a treehouse, the kids pick up practical maths skills and touch on various subject areas as and when they are appropriate. We offer maths (Montessori-style), science and experiments, organic gardening, cooking, needle work and carpentry, yoga and mindfulness. We have a bilingual day every week (English-Spanish), periodic trapeze classes and regular outdoor excursions. After establishing the specific curricular needs and objectives of the parents and their children, and to ensure the optimal development of literacy and numeracy skills and coherence within the national curriculum, we also offer more focused workshops. This we think is especially important for parents who may later decide to put their children in the public system. But we are not stopping here. This year, we are looking to expand on what are core wider values of wellbeing and sustainability. And we want to take the kids outside more, and do this in a way that acknowledges and engages with the local milieu, both environmental and social. This angle has emerged from my research in biosocial anthropology. We are increasingly aware of how social, economic, political, environmental factors and the ‘mind’ impact, or rather dialogue, with our biologies – which are also far from generic. These factors co-constitute us as people, and if we attend to them appropriately, we can be more effective in enhancing our health and wellbeing and better potentialise our ability to learn too. This way, particular socio-cultural values and practices are valorised and passed on, and the colonising effects of globalisation are mitigated. Key parenting books like “Everyday Blessings” (on mindful parenting) and the “Continuum Complex” (on keeping our evolutionary ancestry in mind) provide generic or culturally ‘borrowed’ solutions, which while excellent, may not always fit into the particular socio-environmental contexts in which we live. What we are after then is a ‘glocal’ education: one that incorporates globally valued skills and knowledge, but one that also respects local knowledge. Both can then dialogue on equal grounds. So, what might this look like? Well, for instance, the school calendar would be organised around customary subsistence lifestyles, with greater activity in the summer than the winter. Learning takes place outside, and invites elders to divulge their knowledge, experience and stories as they recall them with reference to the local environment. Astrological and climatic knowledge is explained using local language and idiom and local constellations are learned which can be paired up with the standardised ‘global’ knowledge on these subjects. Children actively engage in local socio-cultural events, and pay attention to global festivities too. Maths, science, physics, chemistry, language and literature can be grounded within local and customary tasks and actions, and more than this, they can be taught using culturally appropriate language and method (pedagogy). The principle is this: worldly knowledge starts at home. Tactile, hands-on and subjective knowledge acquired through personal experience can take place when people are exposed to stimulating learning environments, both outdoor and indoor. Visceral knowledge gained from the surrounding milieu can come to inspire personal projects, and these projects can then reach out not only to the global community, but to the local one too. 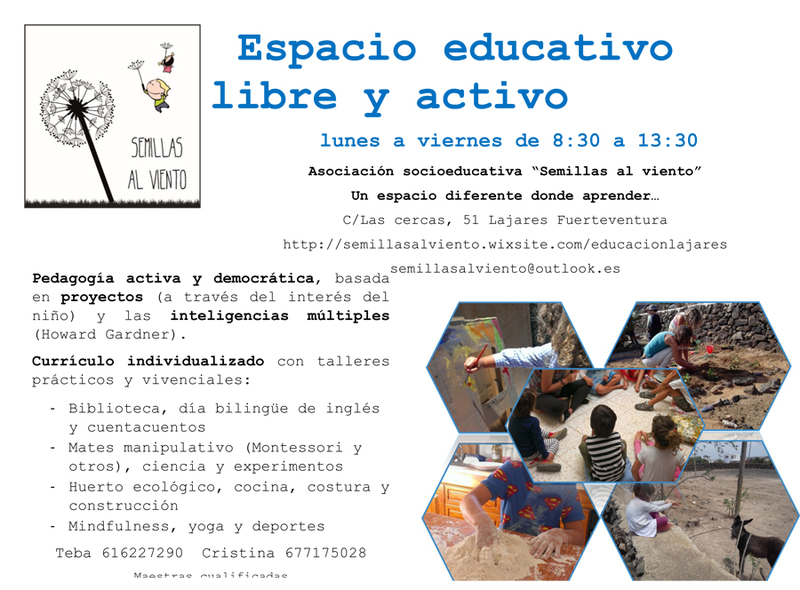 Find out more on get in contact at semillasalviento@outlook.es. Are you interested in getting more involved? Are you interested in alternatives to conventional education? What would they look like where you live? How can local knowledge be revitalised and effectively communicated to the next generation? What social and environmental spaces can be potentialised to facilitate this interaction? What does this mean in terms of pedagogy and curriculum? Can new and holistic approaches be standardised, or are they more fluid? How can flexible and child-centred pedagogies be respected in light of bureaucratic demands? If you have a comment or would like to share your experiences, please do so at the end of this blog.